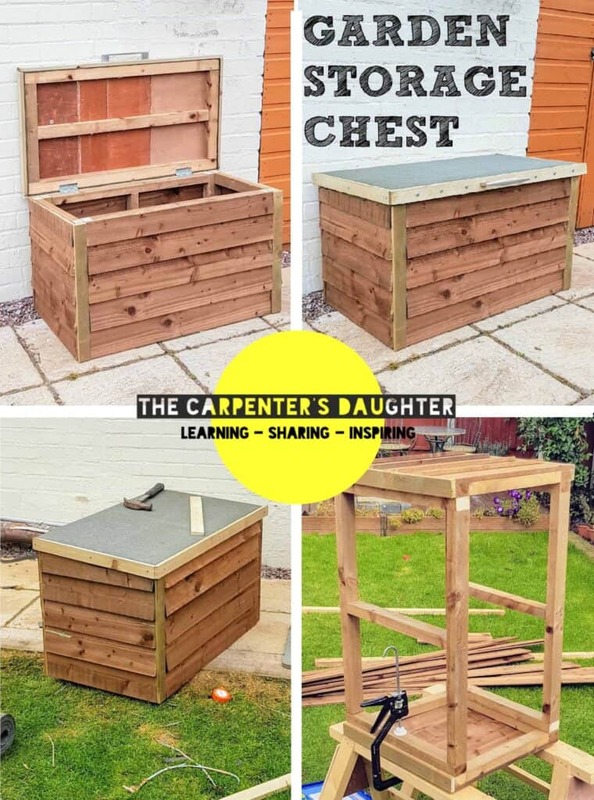 In this post, I show you how I made a practical garden storage chest with waterproof hinged lid. On the rare occasion I’m out, sometimes I miss our Amazon deliverie. And we previously used a plastic garden storage chest as a discreet place to hide our purchases. Well, that was until it broke recently. But instead of buying another, I really wanted to take this as an opportunity to build one myself. But also learn more about woodworking. 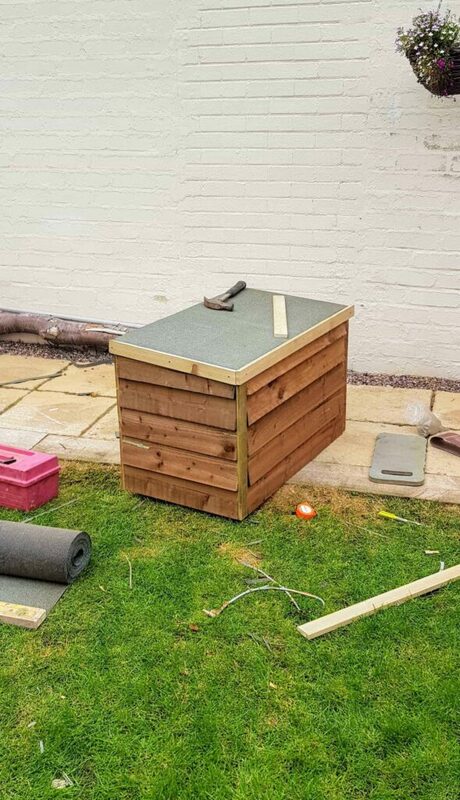 Also, making a shed has appealed for a long time, so thought, why not start small with a garden storage chest? I am notoriously well known on my YouTube channel for avoiding big power tools. I grew up with a Dad persistently telling me to stay away. So, please don’t let this gifted Evolution mitre saw and stand intimidate you. 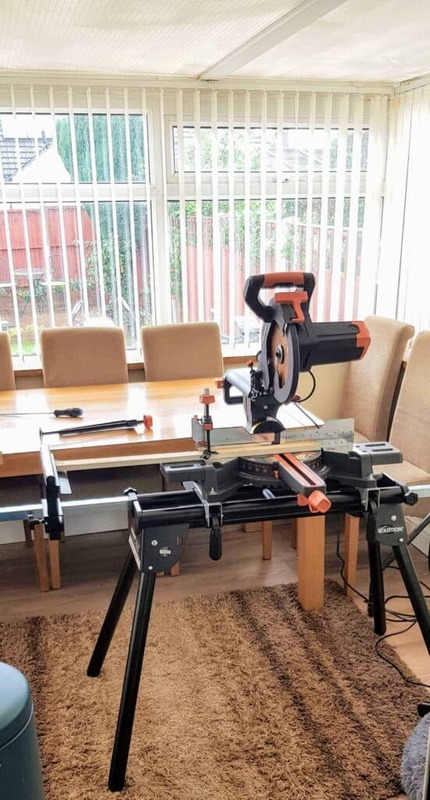 If you don’t have one, then as an absolute basic, you’ll need a panel hand saw like this. However, if you’re more than an occasional DIYer, then it does speed things up. But I’m certainly happy building things at my leisurely pace. 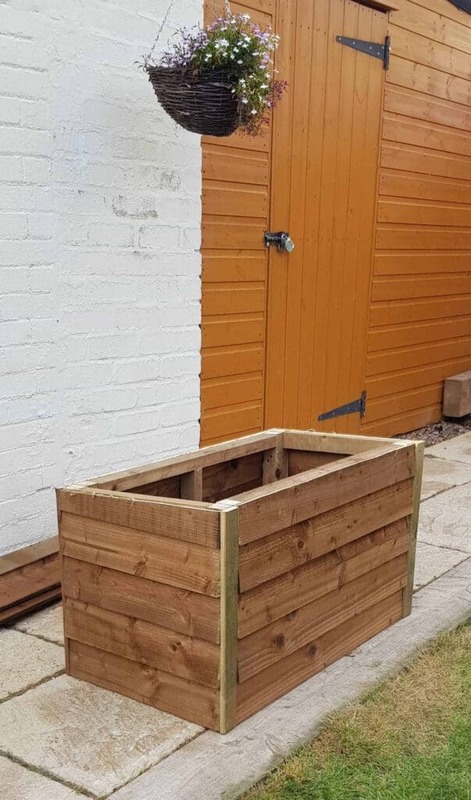 First, determine the height you want for your garden storage chest. Note, I challenged myself to make a sloping box so rain would run off. To do this, I laid out some framework using a homemade spacer. Mine’s a skirting board with a lip I attached. Then I’d overlap it by 15mm and I could work out where I wanted either side to finish at the top. If you want to do a basic square garden storage chest, then still do this mock run. That way, you know you’re not left with a strip that’s too small to hammer and nail at the top. Mark where you want to cut the timber. Then clamp the framework’s timber together. And follow on by pre-drilling holes before screwing to avoid your wood splitting. 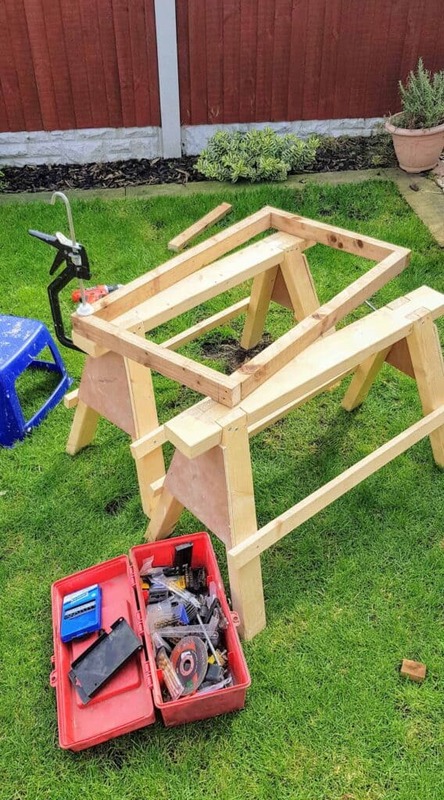 Once you’ve got a square frame for your garden storage chest, cut and screw another batten to fit in to the centre for stability. Then cut your feather edge boards to the same width. Now, hold a straight edge against once side so you can push the feather edge strips against it for an even side. Then hammer them on to the frame board by board until you get to the top. Now cut the excess feather edge off. So you’ll need to repeat this again to exactly the same measurements for the opposite side of the box. Also, immediately after this photo, I cut some trim strips (15mm x 45mm) to the height of either side of the panels. 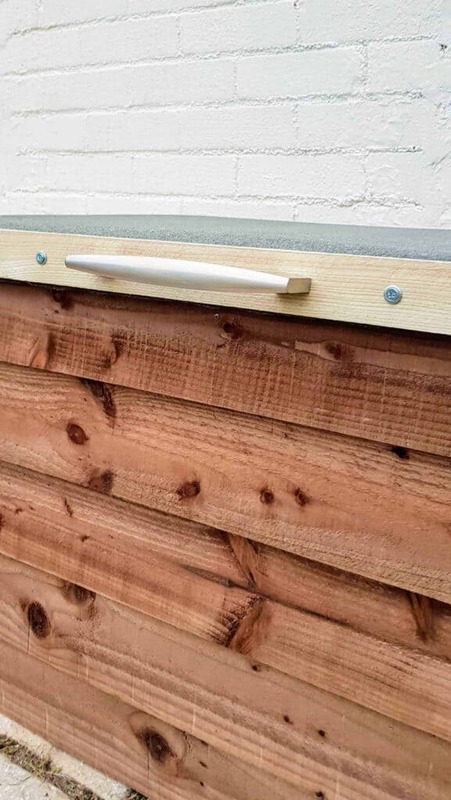 This would then act as a trim to cover up the cut edges of feather edge for a stylish garden storage chest. Then I needed to create the front and back of my garden storage chest. Note, if you have rectangular framework, then make sure they’re facing the same way in front of you as you go. If not, it can have an effect the flooring at the end. Also, you’ll need longer screws if the widest side if facing you. 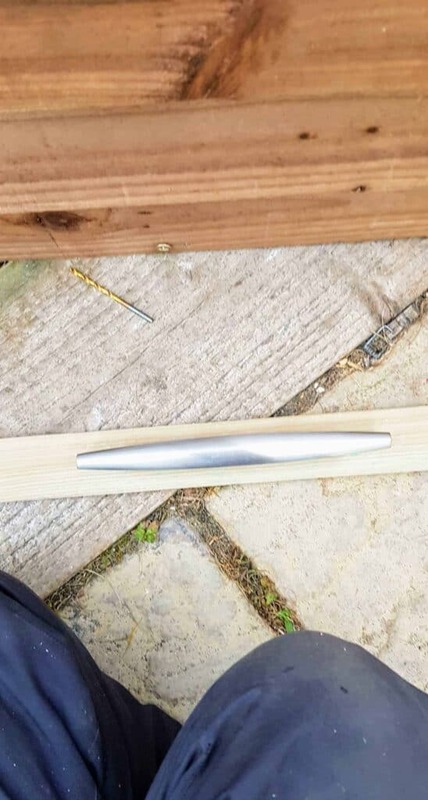 You’ll need a countersink bit so you can ensure the screwheads don’t protrude as we’ll be fixing timber to timber shortly. Then cut a batten for the middle and attach. It’s also a good idea to use a roofer’s square as you go for perfect right angles. Another point to make is that if you’re using tanalised timber. That’s because it’s already treated and you won’t need to preserve any cuts to live outside. MY GARDEN STORAGE CHEST IS STARTING TO TAKE SHAPE! Now repeat this for the opposite side. Note, if you’re doing a sloping roof, you’ll need to measure it again for the right measurements. This includes cut mitred ends. 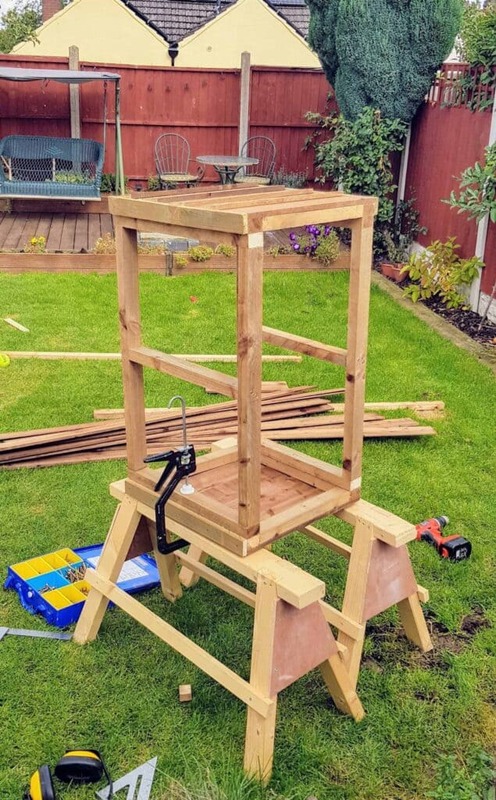 So we’re back to clamping again and you’ll need to trap the frame work to one of the ends while also to a table or sawhorse. Then, fix the front and back framework to the side. But again, always ensure you pre-drill and screw. You don’t need a countersink bit for this section. 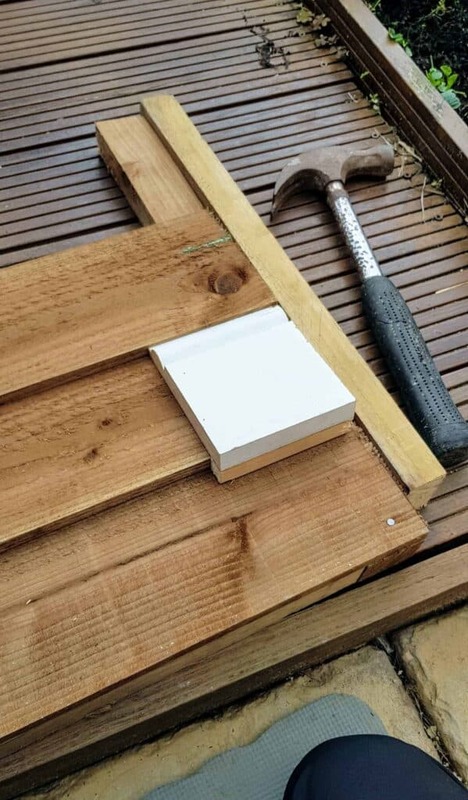 And before you finish the rest of the cladding as above, you’ll need to fix one more batten for the base area which has naturally formed the moment you attached all the sides on. This is imperative as a floor support. 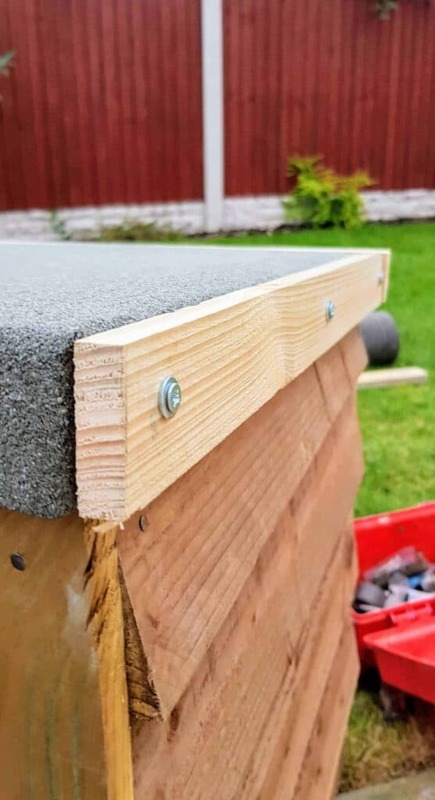 TIP: Generally I think a batten every 30cm is a good idea – however, I needed an extra one for the end panels as there was too much movement in the feather edge boards. If you’ve got this far already, then the rest is a piece of cake. Make another frame for the top that measures exactly the same at the top of your box. I also included the feather edge for a bit of a lip. 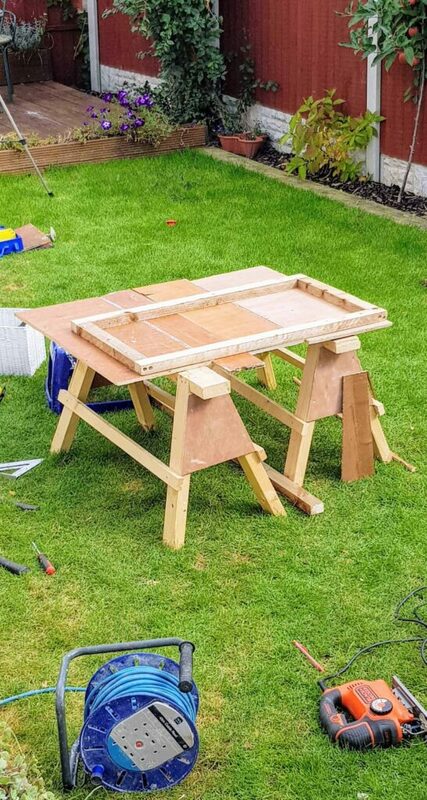 Then, place what is ideally one whole piece of 10mm-ish plywood or OBS on top to screw directly through it to the frame. MAKE SURE YOU COUNTERSINK THESE SCREWS so it doesn’t catch on the felt lining over time. Once in place, cut the excess off with a hand saw. Above, you can see I didn’t have a whole piece and made do with what I had and butted some strips together. Next, I added another batten for strength in the middle. If you’re using a whole piece, then you’ll probably want a batten positioned the opposite way to how I did it below. I also had joins (or seams if you will) where my ply butted together and because I don’t have a table saw for perfect straight edges, I used some gaffa tape to cover them up. My gaps may only have been a mm or two out here and there, but I want this to last. Then to allow the lid to open with just one hand, I lined up the lid with the box. Followed by marking where my hinges needed to be (mine are regular door ones). Now fixed them in to place. Note, I didn’t chisel these in to the door and because they’re laying flat, I saw no point. This was the expensive bit. I only needed 1 metre of felt and could only see them for sale in 8-10m rolls. 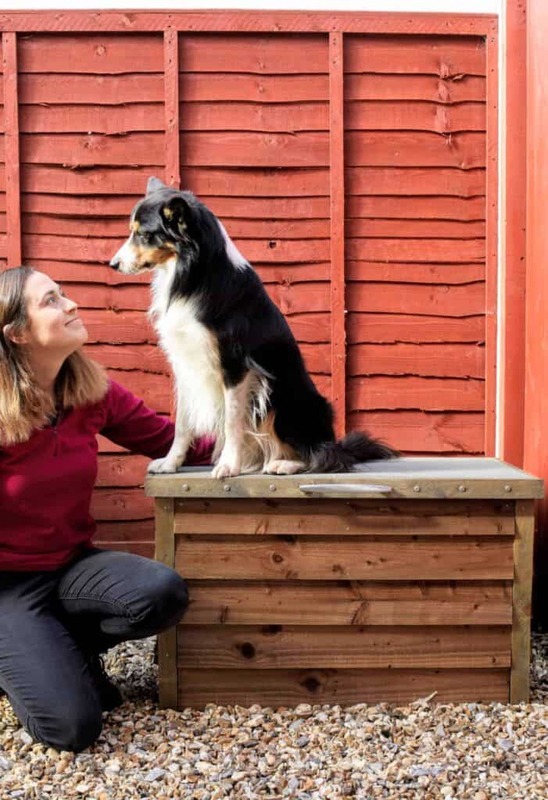 I picked mine up from Wickes for best price and quality – about £16 after a 10% discount. Then I cut a section with an overlap of 50mm. As this box is small, my Dad confirmed I didn’t need to use felt adhesive (so I took that back for a refund). I laid the felt on top and hammered around the sides with 13mm clout nails while also pulling it taut. For the corners, if you’re not adding trim, they do look stylish folded over before hammering, However, it protruded a bit too much for my trim, so I made a straight slit in line with the longest side, then tucked under the other side. (Don’t worry, I have a full video below to follow along with). Make sure you buy a trim that is the same depth as your frame and ply or OSB put together. I found this at my local sheds and fencing supplier. Because this was for a lid which will get plenty of use, I found screwing the trim was much stronger. After hammering a trim on initially, I found it pulled off far too easily. So I pre-drilled holes before fixing with screws and washers as extra detail. TIPS: Don’t fix too close to the edges (less than about 1 inch) as the wood may split. Mine did. Also, make sure your clout nails are not in the way. There’s so many handles and locks out there to suit your taste. However, I had plenty of kitchen handles left over, so used this brushed metal coated one which should not rust. 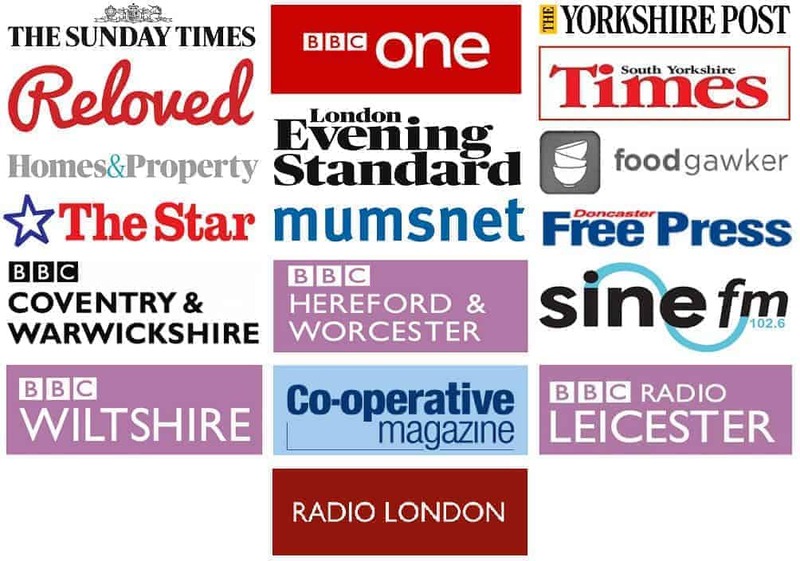 This was possibly the hardest handle to fit as they usually come with a template because you need to be precise where you’re screwing from the back. If you can find one where the screws are visible from the front, then perfect! I had to absolutely use a countersink bit for this too to bury the screw heads before fitting this last bit of trim. I then later stained the trim to match. So, because I didn’t want to store things where they’d sit on the floor, I screwed down some OSB which is a great material in damp conditions. You’ll also see that I used wood I had leftover by butting two pieces together and cut some notches out. This isn’t ideal if I want to stand inside it, not that I ever would. But, instead, you could add slats instead. 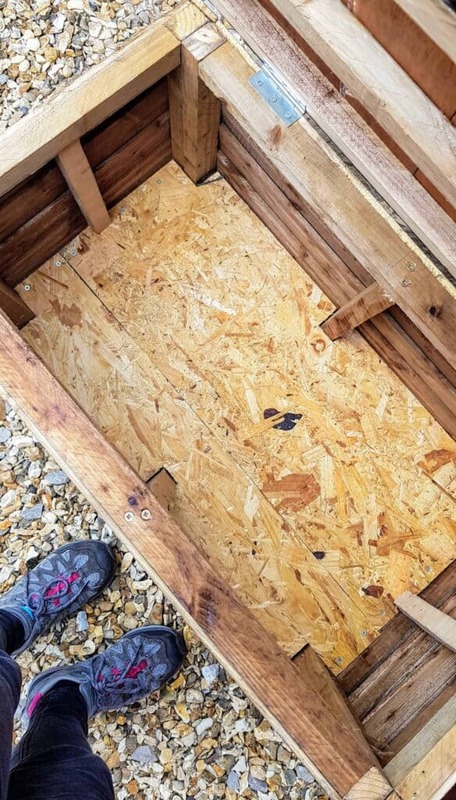 Another thing you’ll need to do is either add some tanalised timber feet, or rest it on top of some tanalised boards so it’s not directly touching the ground to rot. I’m at less of a risk as it lives directly on gravel for rain to naturally drain away, but my Dad has advised me to do this regardless. Also, any wood that isn’t tanalised, such as the paler battens you see here and the ply lid, I treated with a wood preserve which should be done yearly. And I’m now proud that I challenged myself which also resulted with something robust and stylish. The total spend was about £50. It’s not the cheapest project, but I’ve since seen these available ranging from £89-119. 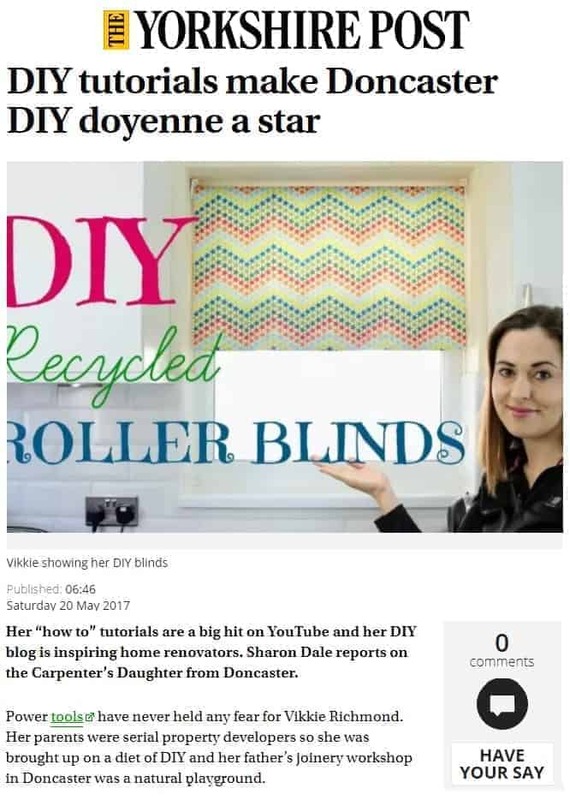 I’ve also learnt some new DIY skills and have plenty of felt for future projects…. perhaps a kennel for Hans? There’s no shame in being a visual learner. I am definitely one, which is why it’s important that I film my projects as I go along to help others. 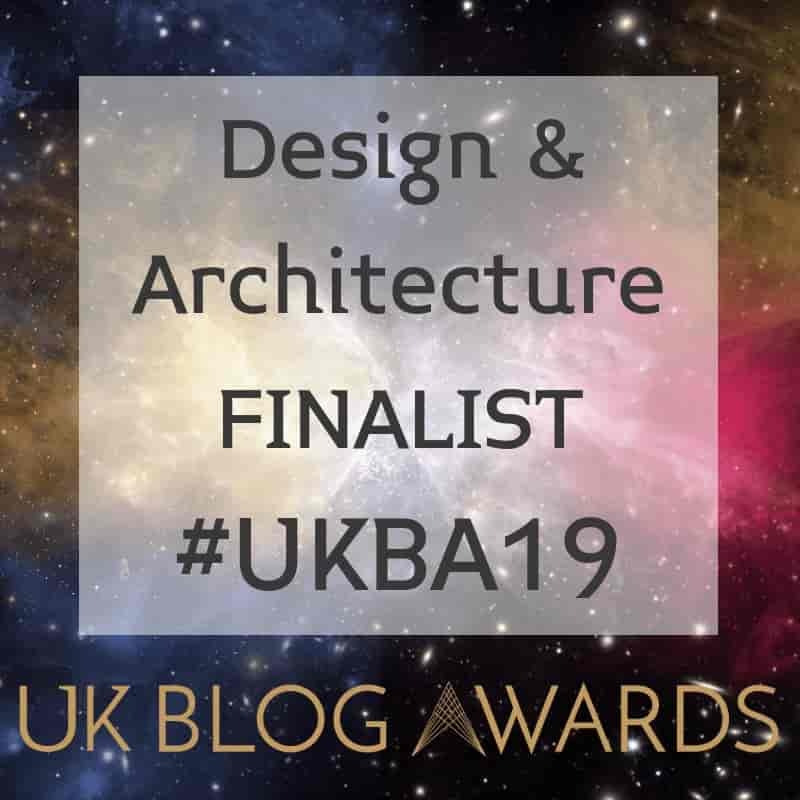 So if you’re a bit puzzled by any of these steps, then here’s how I did it and what issues I faced from a novice’s perspective. 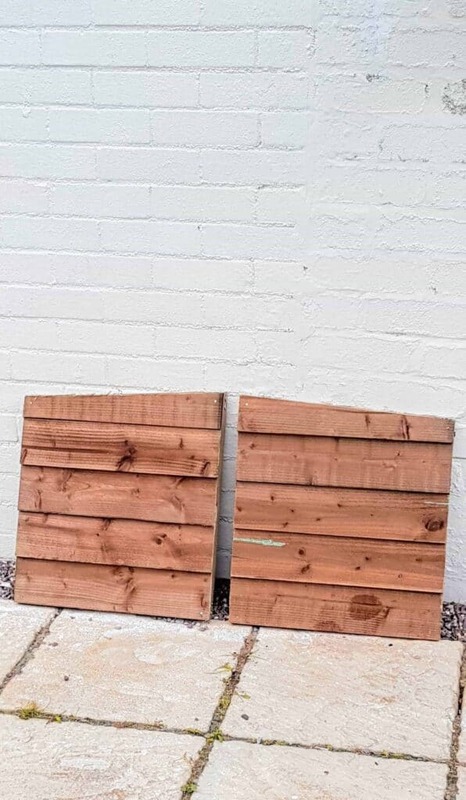 How I built my double wooden garden gates. Disclosure: I was gifted a mitre saw and stand by Evolution power tools, but isn’t essential for the job. 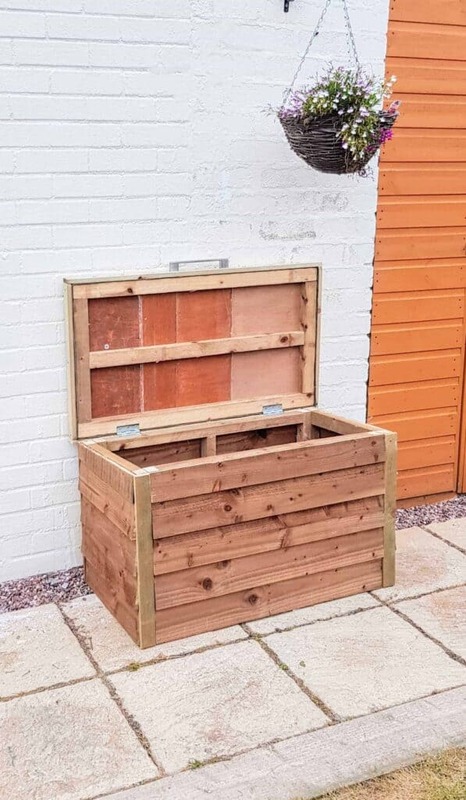 This garden storage chest is not sponsored in any way. That looks really tidy and professional, I’d like to be able to get my projects as neat as that. 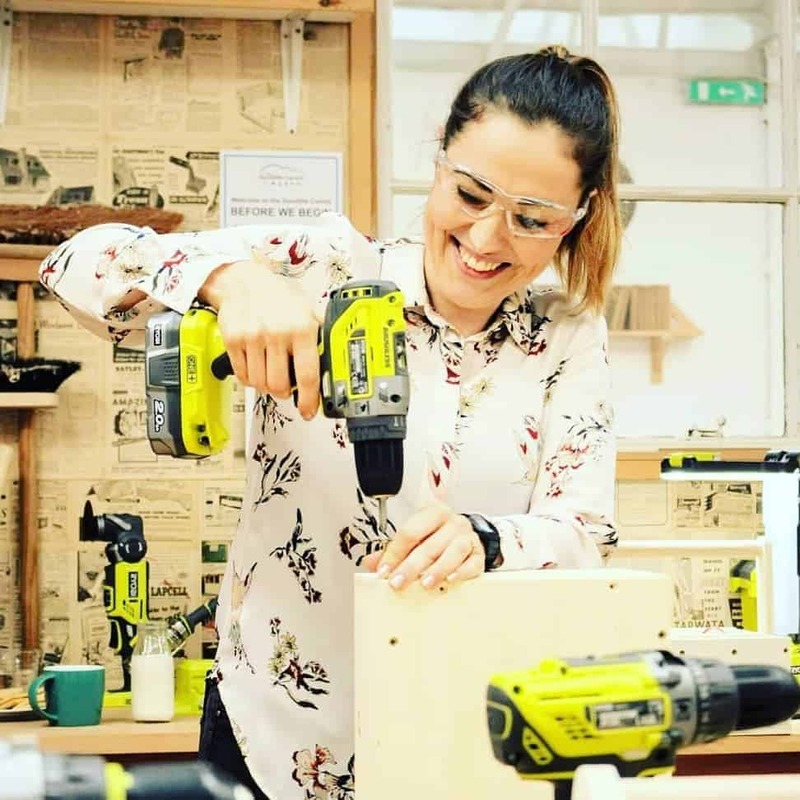 Do you have any further tips for fitting hinges? I’ve really struggled with those, whether I chisel them or not. 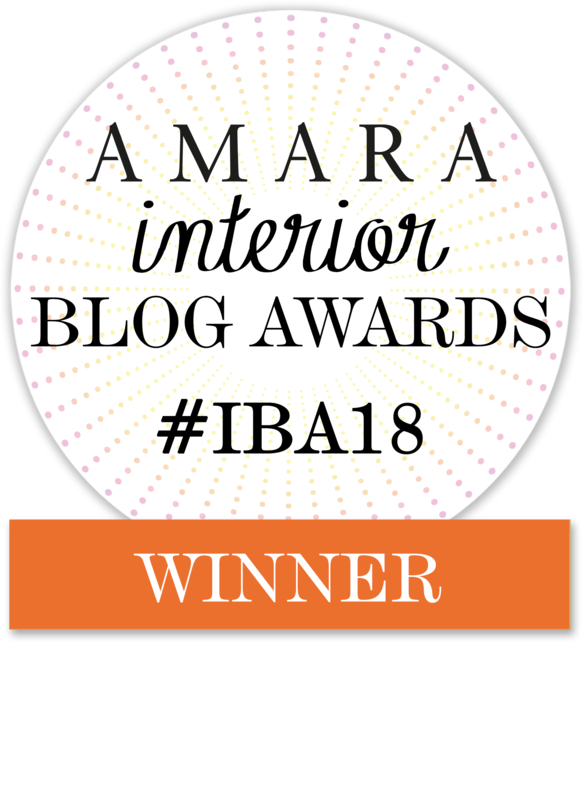 (I’ve got cupboard doors in my camper that don’t match and two ruined doors in home that are either sprung closed or spring open, no consistency!) thanks for the guide and YouTube bids. It it becomes loose over time, then I’ll definitely do this. Hope that helps to line them up too!